Before we get into the interview, here’s a quick introduction to Rosemary Edghill and her work. 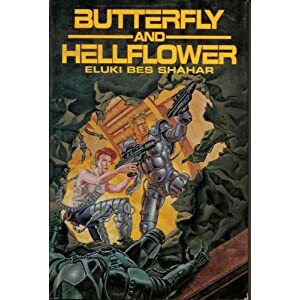 She has written many books, including the acclaimed Hellflower trilogy of science fiction novels (as eluki bes shahar), the Bast series of present-day Wiccan detective novels, four fantasy novels (including the Twelve Treasures series), four Regency romances, a couple of X-men tie-ins, one time-travel romance, and now the dark SF/fantasy hybrid VENGEANCE OF MASKS (reviewed here). She’s collaborated extensively with Mercedes Lackey, most recently with DEAD RECKONING (SBR review is here; the SBR review for books 1 and 2 of the Shadow Grail series is available here), and has also collaborated with science fiction and fantasy grandmasters André Norton (THE SHADOW OF ALBION and LEOPARD IN EXILE) and Marion Zimmer Bradley (WITCHLIGHT, GHOSTLIGHT, GRAVELIGHT and HEARTLIGHT). Shiny Book Review: Ms. Edghill, thank you for coming to Shiny Book Review for an interview. We’re very glad you’ve stopped by. Rosemary Edghill: Thank you for inviting me! I’ve just finished what Bloomsbury calls a “virtual book tour” for my latest, a Steampunk Western With Zombies called DEAD RECKONING, and while I’ve never actually been book toured, I have to say that the virtual tour is a lot of fun. It’s great to meet readers from the comfort of my own keyboard . . . . Shiny Book Review: DEAD RECKONING was a lot of fun to read. What prompted you and Mercedes Lackey to write a steampunk Western? Rosemary Edghill: When we made up our mind to do a Western (I’d already had the character of Jett Gallatin in mind for some time) it would clearly, given our track records, have to be a fantasy. And we were both huge fans of the ORIGINAL Wild Wild West (just . . . don’t mention that horrible movie. Please. ), which was really the very first steampunk. So since we both really love SF, going steampunk was really a way to incorporate SFnal elements into what most people would see as a straight-up historical fantasy. Shiny Book Review: Speaking of that, does that mean DEAD RECKONING happened in “our” United States of America? Or is this an alternate history/fantasy? Rosemary Edghill: DEAD RECKONING is a “secret history” as opposed to an “alternate history” — ie, no matter what bizarre elements surface in the course of the books, they will always be taking place in our own recognizable past. Shiny Book Review: Which character in DEAD RECKONING did you enjoy writing the most, and why? And which one (or ones) did you enjoy writing the least? Rosemary Edghill: I love all of them when I’m writing them (even Brother Raymond!) but the ones I really felt sorry for were the women of the commune, who were being terribly exploited. Shiny Book Review: The way religion was subverted by Brother Shepherd in DEAD RECKONING gives an excellent “period feel” to the novel. What types of religious movements (or counter-movements) did you study/read about that gave you the idea for Brother Shepherd and his cult? Rosemary Edghill: The Western Expansion period was a time of enormous religious experimentation in the United States. This actually began fifty years earlier, with the rise of the Mormon faith in the 1820s. In the period directly following the end of the Civil War, thousands of “Christian Primitive” and millenialist cults sprang up, many taking advantage of the looser social rules and legal strictures of the Western territories. These cult/communes really haven’t changed much since the Anabaptists kicked things off in the 1400s, and were still going strong in the California of the 1930s — Raymond Chandler uses them as backdrop for a couple of his Philip Marlowe novels. Shiny Book Review: You’ve collaborated often with Mercedes Lackey; what’s it like to write with her? Rosemary Edghill: It’s a lot of fun! You’re never alone with a co-author! Shiny Book Review: Tell me about VENGEANCE OF MASKS. What prompted this specific, dark-tinged plotline? Rosemary Edghill: Never never never discover Michael Moorcock’s Elric of Melnibone novels in the same month you start reading Dorothy Dunnett’s “Crawford of Lymond” saga. I think somewhere in the bottom of my mind was: we all know authors put their characters through hell. But what if it were done not from love, but callously and inappropriately? What recourse would a character have . . . Shiny Book Review: That’s one of the reasons VENGEANCE is such an interesting book. But speaking of your hero, Childeric, what is it that torments him so? Rosemary Edghill: He destroyed his entire world by being manipulated by the Dead God Malvisage into freeing him. That can leave a guy with a real complex. Shiny Book Review: What about your heroine, Arcadia? What in her responds so strongly to Childeric? Rosemary Edghill: She wrote the books about him. I wanted to put her in the context of the early Sixties Sword and Sorcery revival — the Conan books were being reprinted everywhere, and they had billions of imitators. I used to own quite a number of those: Brak and Blade and oh, every possible one-syllable grunt you can imagine. And there were a lot of what we would consider today fly by night publishing houses out there, to which you might sell a book if you needed a quick few hundred bucks, and then find you’d signed away all rights forever. Shiny Book Review: What made you come up with such a unique and interesting plot, as this reads half like a fantasy, and half like science fiction (a la Sheri S. Tepper)? Rosemary Edghill: As for the plot, it really isn’t unique. It’s a variation on an old fannish trope: “fan finds themselves in sourcetext universe of their choice”. I’ve seen it done for Star Wars, Star Trek, and Blake’s 7 — the only change I made was to have Cady create the sourcetext she fell into. And I don’t think that idea is unique either. But as I’ve always said: if you find an original idea anywhere in my work, I will eat it. Good stories aren’t about showing us something we’ve never seen before. Good stories are about showing us things we’ve seen all over the place in a way we’ve never quite seen them. Shiny Book Review: Cross-genre books seem to be one of your specialties, going back to the Twelve Treasures series — what is it about books like VENGEANCE OF MASKS or DEAD RECKONING that first makes you want to write them, then makes you perfect them to the point the reader has a hard time putting them down? Rosemary Edghill: ::laughs:: Well, I HOPE the reader has a hard time putting them down! The answer to that is another one of those bizarrely-simple-only-not ones: write what you want to read. A writer’s first audience is themself: you tell yourself the story. As for *why* this is the kind of story that attracts me, I can’t really say. Maybe I’m just always hoping for magic to show up in my world — the fantasy kind, with swords and unicorns and heroes. Especially heroes. Shiny Book Review: Nothing wrong with that. At any rate, I’d like to shift the focus now and ask some questions about your writing career. For starters, when did you first realize that you enjoyed writing and that you weren’t about to give it up? Rosemary Edghill: I started writing back in the 1980s, and I sold my first two books (one SF, one Regency) very quickly, and both on multi-book contracts. So I had commitments to write several books from the very beginning, and like a good do-bee, I kept right on typing. Later, of course, things got hard, and the market changed, and a lot of other things happened. But I pretty much committed as a writer long before I evaluated the question of whether or not I wanted a career as a writer. Hey. Sometimes that happens. Shiny Book Review: What drove you to write your first novel, TURKISH DELIGHT? Rosemary Edghill: When I wrote TURKISH DELIGHT, I’d read through all of Georgette Heyer and was totally in love with the whole “comedy of manners” idea, but the books I was seeing on the stands fell somewhat short of the standard set by the Divine Georgette. So I wrote my own. I would be happy to still be writing them, but the overall market collapsed, including the St. Martin’s Press program that had been doing them in hardcover. My editor, Lincoln Child, had moved on (to his own career as a best-selling novelist, as a matter of fact), and it was pretty much a case of my corner of the market having dried up. At the same time, I’d just finished the last of the SF trilogy I sold the same week that I sold the first of the Regencies, and while my editor (Sheila Gilbert of DAW Books) liked my writing style, science fiction wasn’t selling. So I ended up over in Urban Fantasy, with the Twelve Treasures series. While I was selling multi-genre-ally from the beginning, it has to be acknowledged that there’s a certain cachet to hardcover publication, and while my sales figures weren’t terribly impressive on any of my first six books, the critical reviews were, and that helped a lot. Shiny Book Review: You’ve worked with two acknowledged Grandmasters, Andre Norton and Marion Zimmer Bradley. What was that like? And what did you learn from them that you’ve taken into other writing projects (solo and/or collaborative)? Rosemary Edghill: What I learned from each of them was to find out where the story was and tell it. Both of them were really straightforward as writers, and focused most of all on the story. I loved working with each of them: the two experiences were very different (with Marion I got notes at the end of each draft, and I was working from a lot of material; with Andre it was weekly phone calls as we went over the project just about scene by scene), both in the nuts and bolts of the method, and just in how the whole project was influenced by their personalities. Shiny Book Review: Tell me about your Bast series. What was it like to write that? Rosemary Edghill: One of the reasons I wrote it was that I’d just moved Upstate and was terribly homesick for New York, so writing a story set in Manhattan was a way of going back there. For another, I just wasn’t seeing a lot of Wiccan character fiction that wasn’t outright fantasy (full of spells and fantasy creatures) or that concentrated on the Wicca part of stuff. Also, as I think I mentioned once to somebody else, the first in the series SPEAK DAGGERS TO HER, was my attempt to come up with (at least in a fictional setting) the answer to a question I’d had for a long time. Because, you see, a friend of mine knew someone very much like Miriam Seabrook, who died in the way the one in the story does. Who she got mixed up with, and how she died, and why, are questions that remain unanswered in the real world. But it is the province of fiction to make a completed story out of a handful of unfinished facts . . . 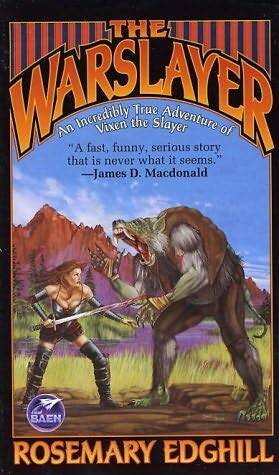 Shiny Book Review: Tell me about WARSLAYER. Rosemary Edghill: The Warslayer is one of my favorite books to have written (it has much the same plot as VENGEANCE OF MASKS, actually, only from a slightly different angle) but my very favorite parts of it are the ones I didn’t write. The Forward and the First Season Episode Guide to “The Incredibly True Adventures of Vixen the Slayer” were written by noted author, my former editor, and all around nice guy Greg Cox. He’d done guides for Xena and Hercules, so it was really a no-brainer to come and ask him to play. As for the book itself, one of my favorite stories is that of The Accidental Hero — the ordinary person who stands up at a moment of crisis and peril and just goes for it. And while Glory McArdle — ex-Olympic athelete, current cable TV sensation — isn’t entirely ordinary, she’s far from being the character she plays. So that was totally a romp for me. My one regret is that the book didn’t generate a sequel, since I would really have liked to tell more stories set in Erchanen. There’s this Sister Bernadette cosplayer from our world, you see, and . . . Shiny Book Review: You’ve written in many genres in the past; which genre, overall, would you like to work more in down the road? Rosemary Edghill: My forlorn dream is to write more space opera, since I started there, and I really love it. And maybe someday I can figure out a way to get back there. I just finished a short story for a small press anthology called GALACTIC CREATURES, where I experimented with the idea of a hard-science space opera: using the space-opera tropes that could be mapped onto a science-based future that does not contain things like handwavy FTL and miraculous fake gravity. It involved many long nights on Wikipedia, but it was a lot of fun. Shiny Book Review: It sounds like it. I’ll have to remember to look that one up. Anyway, since you’ve written in a great many genres, you must have had to research all sorts of things. Which genre is the most demanding to research? Rosemary Edghill: The most demanding genre to research is near-past historical, fifty to a hundred years before your now. Farther back, the period has been studied and written about, and most of all, there’s nobody still alive from then. If you make a mistake, so long as it is imbedded in a plausible matrix of period work, you’ll probably get away with it. With the near-past stuff, somebody’s always going to call you on it. That being said, my favorite book of all I’ve written is still HEARTLIGHT, when I had to do huge huge huge amounts of research about the 60s through the 80s. I wrote it in the late 1990s, and I was still having to chase down and nail landmark 80s fashions, fads, and news stories from the point of view of an outsider. I hadn’t been taking notes! Shiny Book Review: Since you’ve written some X-men tie-ins and are familiar with the superhero genre, what do you think it is about superheroes that’s brought them into the mainstream? Rosemary Edghill: Oh, that one’s easy: Money. ComicCon got “big” when television and movie publicity machines started using it as their main venue to premier and pump up genre releases and programming. Hollywood has crazy amounts of money compared to every other entertainment field, and it’s really the eight thousand pound gorilla. So once it had monetized ComicCon, everybody looked around and saw all those superheroes just standing around. But getting them onto the screen in a way the audience could buy in was still a long way off. It was a question of “selling the sizzle” carried to its ultimate expression. And it wasn’t the subject matter. The *idea* of the superhero has been with us since the dawn of tale-telling. Achilles and Beowulf both fill the social niche of the superhero. But once you start dealing with people who can fly, or burst into flames, if you want to *film* them, you need to wait for your SFX to catch up. Shiny Book Review: You’ve written short stories, novellas, novels, take your pick. What is different about the process of writing from the shorter stories to the longer ones? And which type of story (short story, novella, novel) do you enjoy writing the most? Rosemary Edghill: Novels, the longer the better. I used to hate long form, now I’ve discovered I love the elbow room (had to cut my last manuscript down from 1600 pages to 600 for publication: ouch). The difference between a short story and a novel is that the short story, classically, deals with the single defining incident in the protagonist’s life: boom, you’re in. Boom, you’re out. Story done! The novel, on the other hand, wants to show us how they got there, and where they’re going next. It’s more about the journey than about the goal. Shiny Book Review: If there was anything you could change about publishing, what would it be and why? Rosemary Edghill: The IRS’s “Thor Power Tools” decision, which required that inventory be taxed as income. It destroyed the backlist and the midlist in Publishing, and crippled a lot of writers’ careers. Things are changing with PoD becoming more sophisticated and flexible, but that drives its own rights-grab problems, as it means the publisher controls the copyright of the book essentially in perpetuity, since with PoD, the book never goes out of print. There’s a lot of grabbyhands going on in Publishing right now — our editors may believe we’re artists, but nobody else does. All the upper echelons see, most places, is interchangeable Book Food Product units. Shiny Book Review: Shifting gears, what is your writing process like every day? Rosemary Edghill: It’s pretty simple: get up, go to the computer, sit down, type. I start by re-reading the previous day’s pages, then I start the new day’s work. I have a set word-count minimum that I have to meet each day [in my head] but sometimes I’ll do a time-thing too, and set my stint for X hours. Shiny Book Review: What advice would you like to give to new and/or aspiring writers? Rosemary Edghill: Be honest with yourself. Do you want to write and tell stories? There are a lot of venues to getting them out there without going the Big Six published route. Do you want to be a published author and make money from your writing? The advice here is “don’t quit your day job”, because 95% of all published and publishing writers don’t make a living from their writing. What do you really want? To hone your craft, write. To hone the related skills that are just as important, finish what you write. To develop discipline, write every day. There really isn’t other advice. All the rest is frosting. Shiny Book Review: One final question: if you could be the Galactic Overlord for a day, what would you change about the world, and why? Rosemary Edghill: I don’t think I could change everything I wanted to change in just one day, and I would not want to make sweeping changes that controlled people’s thoughts, like “stop being stupid” or “be pro-equality and women’s and gay rights”. For one thing, anybody who reads fairy tales knows that always boomerangs badly. For another, it just seems to me it would be wrong to take away anyone’s freedom that way, even if they’re abusing it enormously. So if I only have 24 hours, I think I would have Incredibly Advanced Aliens come to Earth and give us FTL travel. I think the major psychological problem we’re facing today comes from the dual sense of not having an available frontier, and the knowledge (without the wisdom to deal with it) that our planetary resources are finite and dwindling. Having a whole galaxy full of colonizable planets would change that. For the better, I’d hope. Shiny Book Review: And that concludes today’s interview with author Rosemary Edghill. Thank you very much again for coming to SBR. Rosemary Edghill: Thank you for having me! I love to hear from readers (no matter what they read, because I’m always on the lookout for a new favorite author!) and I can usually be found either at: http://rosemary-edghill.dreamwidth.org/ or http://www.facebook.com/rosemary.edghill My home page has a lot of bibliography and links, and it’s at: http://www.sff.net/people/eluki Feel free to come by and chat about my books and anybody else’s. Really! Mercedes Lackey and Rosemary Edghill’s new cross-genre novel is DEAD RECKONING. It’s a zombie steampunk Western set in 1867 that features a trio of intriguing characters, Jett Gallatin (a seventeen-year-old “male” gunslinger), Honoria Gibbons (called “Gibbons” — she’s an inventor, a genius, and is slightly older than Jett), and White Fox (male, about the same age as the other two, raised from birth with the Sac and Fox tribe but most likely 100% Anglo by blood; he’s a scout). All three are intelligent and spirited misfits, which gives them a quick way to bond while keeping the plotline from getting complacent. DEAD RECKONING opens with Jett stopping off at a saloon in what seems like the middle of nowhere (but is actually west Texas). She’s looking for information about her brother, Phillip, who enlisted in the Confederate Army years ago and hasn’t been seen since. But instead of finding anything out about her brother, she ends up running for her life after zombies — yes, zombies! — attack. Jett’s a skeptic, so this attack deeply unsettles her worldview. But more unsettling things are on the way once she meets up with Gibbons and Fox, as these two know from the start that Jett is female (a closely-guarded secret) due to Jett needing immediate medical attention. More to the point, due to Gibbons’ skill as an inventor (she has a steam coach she calls an “Auto-Tachypode” that usually cruises at a steady 10 mph), Jett realizes she’s not the only non-traditional female out there. When Jett is captured while attempting to gain information from the enemy, Gibbons and Fox quickly decide to rescue her. But will the zombies manage to get to Jett first, especially as Shepherd does seem to have some sort of weird control over them? And even if the zombies don’t get to Jett right off, will Gibbons figure out how to undo whatever it is Shepherd’s done, as that’s the only long-term way to save Jett or anyone else? All of this action-adventure is stimulating, interesting, and very fun to read. 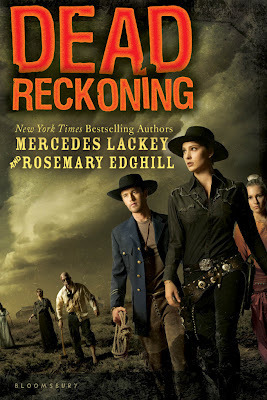 But perhaps the best reason to read DEAD RECKONING is how faithful Lackey and Edghill are to the Western milieu, yet how easily they manage to fit both steampunk and zombies into the story without missing a beat. Bottom line? DEAD RECKONING is an excellent stand-alone, action-adventure novel. So if you like Westerns, zombies, steampunk, or better yet, all three, go grab a copy of DEAD RECKONING once it becomes available on June 5, 2012. You’ll be glad you did.